NYTimes: This is a fascinating picture, which has something real to say about the matter of personal involvement and emotional commitment in a jazzed-up, media-hooked-in world so cluttered with synthetic stimulations that natural feelings are overwhelmed. It is vintage Antonioni fortified with a Hitchcock twist, and it is beautifully photographed in color. Roger Ebert: Antonioni has described the disappearance of his hero as his "signature." It reminds us too of Shakespeare's Prospero, whose actors "were all spirits, and are melted into air." "Blow-Up" audaciously involves us in a plot that promises the solution to a mystery, and leaves us lacking even its players. Slant: In many ways, this is the best film ever made about movies, because Antonioni recognizes the fragile nature of celluloid and the need to preserve great images. 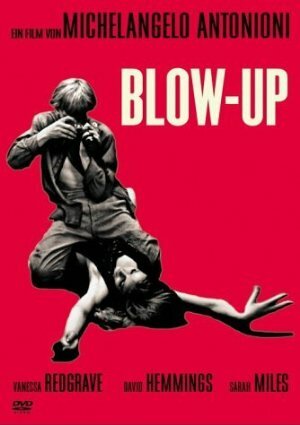 Which is why the film is to profoundly moving—by film's end, Antonioni sadly suggests that one day Blowup won't exist (or mean anything to anyone) if it doesn't continue to be seen, or if its meaning isn't blown-up. The Guardian: Blow-Up is a film about a particular moment in the capital's history. It was made in London in 1966, which aficionados of 60s pop culture will recognise as the absolute perfect place and time. Imagine walking into a small club and witnessing that incendiary performance by the Yardbirds. Astonishingly, the Who, Tomorrow and even the Velvet Underground had been considered for the role. And look – the audience includes a young Michael Palin, and Janet Street Porter in a homemade silver dress. But it also has enduring appeal, thanks to the music (Herbie Hancock's groovy jazz deserves a special mention), the director's ambivalence towards the subject matter and the "beautiful people", who are also repellent. It also reveals an enduring truth about London, my home town: it's never truly knowable. Who knows what goes on in the park hedgerows, in the converted warehouses, behind that nightclub door, where there's always someone hipper than you? I saw this a few years back (2-3) and I hated it. But I agree with The Guardian review fully. I love this movie so so much. I have seen it so many times over the years. The underlying creeping dread throughout is masterful, and it's such a wonderful snapshot of a time and place.